Nine years have passed since John, Jack, and Charles returned from the Archipelago of Dreams. The three men agreed back then that they would not contact one another unless some great emergency arose. Charles and John are therefore surprised and concerned when Jack summons them to his cottage outside the town of Oxford. They do not have much time to discuss Jack's concerns however for soon after they arrive a little girl flies, and crashes, into Jack's garden. Her name is Laura Glue and she is looking for the Caretaker of the Imaginarium Geographica. Unfortunately she is not looking for John, who is the Caretaker Principia. Instead she is looking for ""Jamie."" Apparently her grandfather in the Archipelago of Dreams sent her to find Jamie and to ask for his help. John and his comrades soon figure out that Laura Glue's Jamie is none other than Sir James Barrie, the creator of Peter Pan. James was supposed to become a Caretaker many years ago but he refused to take on the responsibility. And so the Caretakers go to London to see James. Laura Glue gives James the message which her grandfather told her to give to him: ""The Crusade has begun."" Neither James nor the Caretakers understand what this means. Laura Glue also tells the men that children are being kidnapped in the Archipelago. Men who have ""clocks in their bellies"" are taking the children away. The Caretakers and James decide that they need to contact the Archipelago as soon as possible. They send a message and not long after Bert arrives in the Indigo Dragon. The vessel is greatly changed. When the Caretakers last saw her the Indigo Dragon was a seagoing vessel. Now she is a beautiful airship. As the Caretakers, Laura Glue, and Bert sail to the Archipelago Bert explains that children are indeed being stolen all over the Archipelago. In addition the Dragonships have also gone. As if this is not bad enough, the Caretakers learn that their friend Aven is one of the parents whose child has been abducted. As the travelers begin their search for the children and the Dragonships they come to realize that there are even more problems to take into consideration. The Tower of Time, which was damaged when they visited the magical place nine years ago, is now falling apart. Because of this, time itself is fracturing and events which were set in motion centuries ago are imposing themselves on the present. Though there is much that they do not understand, there is one thing that the Caretakers do know. 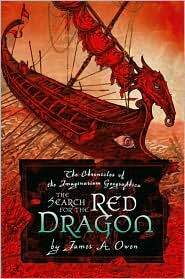 They have to find the Red Dragon, the last of the Dragonships, and if they succeed in this, they just might be in a position to find the stolen children. This extraordinary book will take readers on an remarkable journey not only to the Archipelago of Dreams, but it will also take them to the Underneath, the place mentioned in countless legends and stories, the place where people of all kinds came to rest after long journeys. There they meet Sir Richard Burton, pirates, Titans, and the Lost Boys. They hear the stories about the Pan, the mischief maker who bewitched others with the sounds of his magic flute. Readers who have read the story about Jason and the Argonauts and other Greek myths, will particularly enjoy this tale as they will encounter many old friends. Fairytale and myth combine in a most extraordinary way to create a story which is complex and thoroughly absorbing.